One of the offshoots of blind faith is anti-intellectualism. This is rampant in the message. 1.1 You can't even prove you have a brain! If you ask a message believer why they believe the message, they are likely to respond with a simple, “Because I just believe it!” A Jehovah’s Witness believes the Watchtower Bible and a Scientologist believes in the writings of L. Ron Hubbard, but that doesn’t make them true. The Bible isn’t true because I believe it, the Bible is true and that’s why I believe it. [Opponents of the message will try] to drag you into a mode of reasoning with God's vindicated word of the hour... They hope to get someone to try and defend the message. THAT is what they want. See that subtility? ...[You think] you can defend your revelation by reasoning... Never think you can defend the message by quoting it. These message ministers want you to ignore honest questions about the message. They never want you to even try to make a defense of what you believe. And they rarely treat people who have questions with gentleness and respect. I know God gave you a brain, but it would be terrible if you actually used it. You can't even prove you have a brain! ...we can't prove God exists and we can't even prove that we have a brain. We believe we have a brain by faith alone. His comment would be funny if it wasn't so sad. If you seriously believe that there is no proof of God, I will tell you to watch a single debate between a knowledgeable Christian apologist and an atheist. I do appreciate that empirical data cannot prove that God exists. However, there are many pointers that lead to God's existence. Add to that the illumination of the Holy Spirit while seeking his nature through his Word, and accept Him at his Word… it’s called faith. This is true Christian faith - Every scientific discovery brings more evidence of God's existence and strengthens our faith in God. Every archaeological finding brings increased proof that God has protected the canon of scripture for almost 2,000 years. Meanwhile, every single discovery of fact in the life and ministry of William Branham does just the opposite, making the position of “message believer” an increasingly untenable position. Perceive (learn about) and insight (understanding) translate two related terms, the verb “to grasp, perceive, know” and the noun “insight, grasp” (see the verb “to understand” in Eph 5:17). "you can perceive my insight" may be expressed as ""You can learn about my understanding" or “you can find out how I understand” or “you can come to learn how I regard”. This all involves the use of one's intellect. Ephesians 5:17 demonstrates that, despite the emphasis placed upon the practical orientation and theoretical limitation of knowledge, Paul is not anti-intellectual; the saints are encouraged to make use of their reasoning power. “Comprehending” includes, or is included in, the learning “by experience” (dokimazō) mentioned in Eph 5:10. Comprehension is an ongoing process and always an unfinished business—especially when the “will of the Lord” is its object and total “submission” of the self (Eph 5:21) its essence. The man who “understands” (ho synhiōn) is silent in the “evil time,” according to Amos 5:13. Eph 5:17 may include the advice to learn by listening rather than by speaking too much. they may remake Him in their own image, not recognizing the qualitative difference between God and humanity (v. 25). 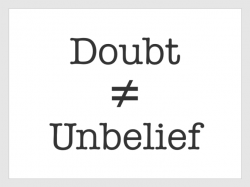 With respect to signs, God may choose to grant them, in hope that people will thereby believe (John 20:31), but he seldom if ever supplies them on demand, and he insists that people have enough evidence for belief without them (John 20:29). Sound and careful logic must be applied to Scripture to yield a full and mature understanding of the spiritual truth God has revealed. This is no denial of the sufficiency of Scripture. The formula is not Scripture plus philosophy, but Scripture interpreted by careful, sensible, thoughtful, Spirit-directed reasoning. That is the essence of discernment. In short, anti-intellectualism is incompatible with genuine spiritual wisdom. 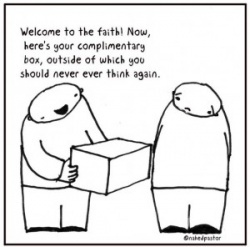 Those who think of faith as the abandonment of reason cannot be truly discerning. Irrationality and discernment are polar opposites. When Paul prayed that the Philippians’ love would “abound still more and more in real knowledge and all discernment” (Phil. 1:9), he was affirming the rationality of true faith. Paul was saying that knowledge and discernment necessarily go hand in hand with genuine spiritual growth. The focus on the enlightenment of the mind introduces an important, but too frequently ignored, part of Paul’s thinking. Too many Christians are passive in their thinking and learning or have an anti-intellectual bias. Part of this is understandable, for “intellectualism” has often been destructive and arrogant, but Christians have recoiled with an anti-intellectualism that leads to ignorance. We do not ward off intellectual attack by being less thoughtful! Christians are not the only ones guilty of anti-intellectualism. We live in a society that has largely stopped thinking. The complexity of life and the overload of information available today has driven us to trite television shows and spectator sports as our main areas of mental stimulation. This text does not suggest we should all be academics or that the solutions to life are all academic. But Christians must always grow in wisdom and in their understanding of life, God, and the relevance of their faith. Wisdom is practical knowledge for right living. The church should first of all be a community of thinkers—not thinking in distinction from action, but thinking as the basis for action. Ignorance is an ethical issue. Historically, Christianity has led the way in promoting education and in starting colleges and universities. Now, most of those previously Christian institutions have lost their attachment to the faith and are little different from secular schools. Pastors used to be respected as the intellectual and moral leaders in society. Now the intellectually gifted tend to go into business or science, and pastors are less and less competent leaders in any area. In the past, when the church has made significant progress—for example, at the Reformation or the great revivals—the best thinkers of the day provided the direction and force for the movement. People like Martin Luther, John Wesley, or Dietrich Bonhoeffer were thinking pioneers who would not accept the status quo, but applied their minds to understanding the implications of the gospel. This kind of inquiring, analytical devotion to the gospel and life still is needed from all of us. Unfortunately, much of modern Christianity is guilty of a drippy sentimentality, or worse, of sensationalism. With the latter, preachers sound more like religious professional wrestlers hyping an audience. We seem more interested in trying to create emotional feeling than in providing an understanding of God and wisdom for living. As a result, many of the world say to Christians, “Your thinking is too superficial for the complexity of the world in which we live.” Christians have reacted against the extremes of this world without thinking through the implications of their choices. This needs to change. A church should be a place for analysis, reflection, and reasoned discussion about the significance of the gospel. Christians should have a reputation as people who think. ↑ The Holy Bible: English Standard Version (Wheaton: Standard Bible Society, 2016), 1 Pe 3:15. ↑ The New International Version (Grand Rapids, MI: Zondervan, 2011), 1 Co 14:20. ↑ The Holy Bible: English Standard Version (Wheaton: Standard Bible Society, 2001), Eph 5:17. ↑ The Holy Bible: English Standard Version (Wheaton: Standard Bible Society, 2001), Eph 3:4. ↑ Robert G. Bratcher and Eugene Albert Nida, A Handbook on Paul’s Letter to the Ephesians, UBS Handbook Series (New York: United Bible Societies, 1993), 71. ↑ Markus Barth, Ephesians: Introduction, Translation, and Commentary on Chapters 4-6, vol. 34A, Anchor Yale Bible (New Haven; London: Yale University Press, 2008), 579. ↑ The Holy Bible: English Standard Version (Wheaton: Standard Bible Society, 2001), 1 Cor 1:18–25. ↑ Craig Blomberg, 1 Corinthians, The NIV Application Commentary (Grand Rapids, MI: Zondervan Publishing House, 1994), 56. ↑ Francis A. Schaeffer, The Complete Works of Francis A. Schaeffer: a Christian Worldview (Westchester, IL: Crossway Books, 1982). ↑ John MacArthur, Reckless Faith: When the Church Loses Its Will to Discern (Wheaton, IL: Crossway Books, 1994), 15–16. ↑ The Holy Bible: King James Version, Electronic Edition of the 1900 Authorized Version. (Bellingham, WA: Logos Research Systems, Inc., 2009), Eph 1:18. ↑ Klyne Snodgrass, Ephesians, The NIV Application Commentary (Grand Rapids, MI: Zondervan, 1996), 88–89. This page was last edited on 26 February 2018, at 21:41.